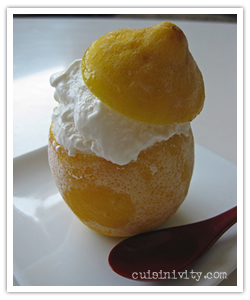 For Frozen Lemon Cup : Cut off the top 1/3 of the lemon (not the stem end) and reserve them. It will be a hat. Use a small knife to cut around the pulp and remove the pulp from the zest gently with a spoon. If you have a grapefruit knife, it will help you to cut underneath the center of the fruit. Be careful not to make a hole at the bottom when you remove the pulp. Reserve the pulp. Make a very shallow cut on the bottom of each lemon shell to make them sit straight up. Be very careful not to cut through to the inside of the lemon. Put them all on a tray and freeze them (ideally a couple of hours ahead of making the ice cream). Lemon Syrup : In a small bowl, squeeze the lemon pulp through a strainer and collect the lemon juice. Combine the lemon juice and sugar in a saucepan and bring to a simmer over medium heat, stirring until the sugar is dissolved. Remove from the heat and refrigerate until chilled. For Lemon Ice Cream : In a small ball, mix 2 tablespoons of the milk and the cornstarch and mix well. In a large saucepan, combine the remaining milk with the heavy cream, sugar and corn syrup. Bring the milk mixture to a boil and simmer over moderate heat until the sugar dissolves - about 4 minutes. Take the milk mixture off the heat and gradually whisk in the cornstarch mixture. Return to a boil and cook, stirring constantly, over moderately high heat until the mixture is slightly thickened, about 1 minute. Gradually whisk the hot milk mixture into the cream cheese until smooth. Whisk in the salt and vanilla. Chill completely. After mixture is completely chilled, whisk in the 6-8 tablespoons of lemon syrup (taste the mixture and adjust the amount of lemon juice you put in as you like). Strain the ice cream base into an ice cream maker and freeze according to the manufacturer's instructions. Scoop soft ice cream into the prepared lemon cup. Filled the cup 1 inch above the rim of the cup and put the "hat" at the top. Put them in a deep air-tight container and freeze until you serve.